The November 2017 (#132) issue of Songlines is now on sale! 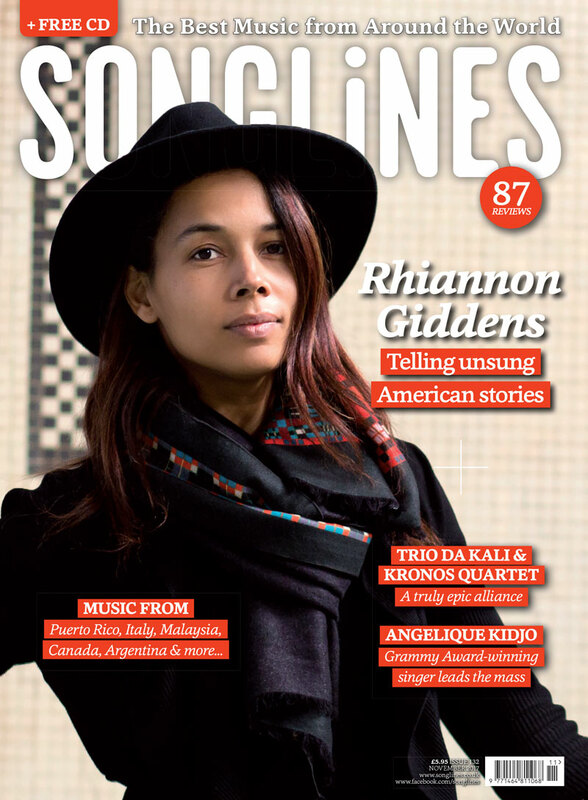 Our cover star this issue is Rhiannon Giddens, the American singer and multi-instrumentalist whose latest release delves into America’s dark slavery past. Other features include an interview with Trio da Kali and Kronos Quartet about their new and thrilling collaboration, Ladilikan; Joe Boyd waxes lyrical about Albanian saze music; Prince Edward Island folk trio The East Pointers who return to the UK on tour; an interview with Vinicio Capossela, Italy’s unlikely star; a Beginner’s Guide to Argentinian bandoneón player, Dino Saluzzi, plus the latest CD, book, world cinema and live reviews. The Top of the World CD includes tracks from Trio da Kali, ÌFÉ, Msafiri Zawose and Lo’Jo, as well as a guest playlist from Australian explorer and writer, Tim Cope, featuring music inspired by his expedition from Mongolia to Hungary on horseback.